Our processes are reguarly updated and are fine tuned to ensure the best possible service is provided at all times, both by the engineers on site, and customer service personel at our office. At Frontline Automation we understand that our most important resource is our staff. All staff are happy and able to provide you with recommendations based on your requirements, whether that is a bespoke designed automated system or an off-the-shelf product for your business or home. Our aim is always to supply and install systems that are reliable and of the highest quality. 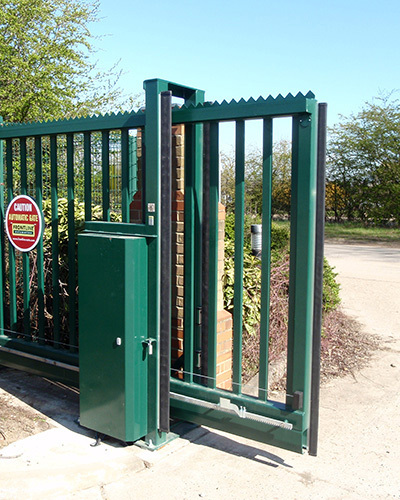 Whether it is a new install or adaptions being made to an existing system, as registered 'Gate Safe Aware' Installers, our fully trained staff can confidently advise you on requirements under gate safety legislation and the machinery directive. There are usually a number of solutions available which will ensure you can have a safe system whilst being both secure and aesthetically to your liking. As members of the DHF, we have undertaken training before being confirmed as meeting the Powered Gate Group safety standards - This means we have been assessed as suitable to assess the safety of electric gates.